Sunday must have felt like Groundhog Day for Ryan Fitzpatrick. Just as he did against Tennessee, Fitzpatrick played a sterling game only to unravel late in the fourth when the Bills were trying to lock up a victory. Just like against the Titans, Fitzpatrick’s late miscue will receive just as much blame as the defense should for another 35+ point performance. That makes five games in which the defense has allowed 30 or more points. Shocking stat of the week: The Bills have lost all five games in which they surrender more than 30 points. Danny Woodhead’s touchdown scamper was another astounding lack of run support from any of the 11 players on the field. But the rest of the performance wasn’t nearly as bad as the travesty that made up back-to-back losses to the Patriots and 49ers earlier in the year. Buffalo outgained the mighty Patriots by nearly 140 yards. Yet they lost the game due in part to ugly penalty yardage and an early fumble that gave the Patriots a short field. Before the final drive of the game for the Bills, CJ Spiller only had nine total touches. He picked up a pair of receptions on that drive to bring his overall number of touches to 11 on the day. 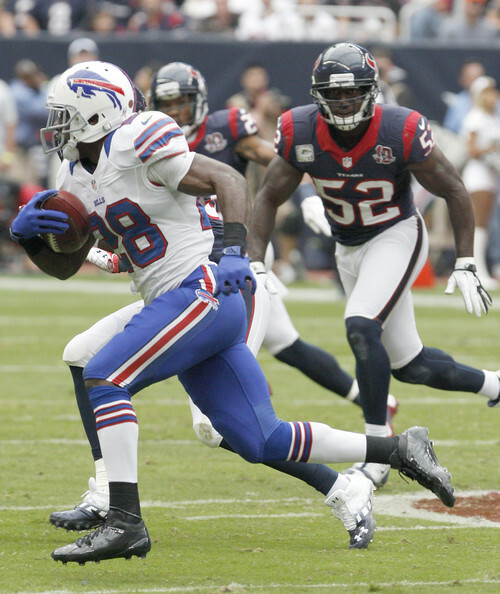 Fred Jackson also had 11 touches. Of the 54 plays the Bills ran, Jackson or Spiller had the ball on 40 percent of them. Nine of the 22 touches the backs had come in the passing game, leaving only 12 total rushes between the two. That is 22% of the offense that went through the running game (excluding runs by Ryan Fitzpatrick and Brad Smith). Yes, less than a quarter of the offense went through a running attack ranked in the top five of the NFL. 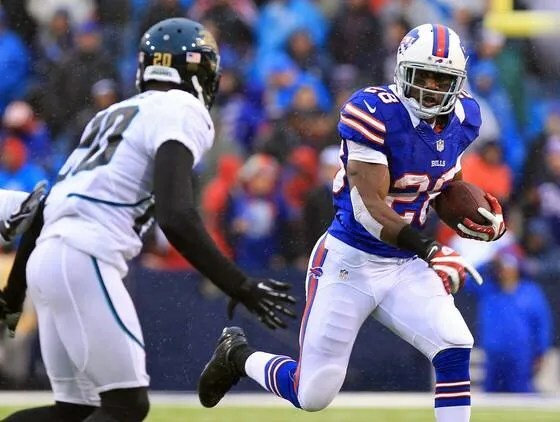 A raise worth $3 million for Bills running back Fred Jackson was long overdue. Buffalo’s favorite underdog finally got his contract extension and will be with the team through 2014. Jackson’s story is well documented. His journey to the top of the Bills depth chart was capped last season when he amassed enormous chunks of yardage before a broken leg sidelined him late in the year. His low salary put Jackson on the potential line of backs to be ushered out of Buffalo by young talent. In fact, Jackson’s emergence was a big part of Marshawn Lynch’s trade. However, Jackson’s value to the Bills offense far exceeds what Lynch ever did for the team and management recognized that. Maybe he should have gotten his dough during the season, but the Bills made sure not to mistreat him for too long. The contract raises his salary to $4.5M per year and locks up the team’s three best weapons (Jackson, Stevie Johnson and FitzMagic) long-term. I do expect Jackson’s touches to go down some next season as C.J. Spiller has also earned the right to see some actual playing time. While Spiller’s strong finish may take carries away from Jackson, it gives the Bills the opportunity to build a proper thunder and lightning duo with their backs. Spiller’s waterbug tendencies and recent effectivness on the ground paired with Jackson’s tenacious running style gives Buffalo a terrific backfield combo.